4th FIW Commanding Officer Glenn Eagleston aloft in his F-86A. 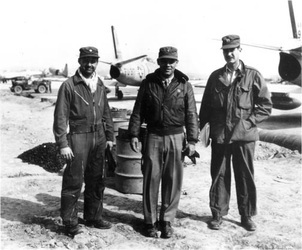 "There has been a tendency by those who write about the Korean War to portray the American fighter pilots as highly experienced, seasoned war veterans, who faced a passel of MiG drivers made up of a polyglot of Chinese, North Korean and whatever other nationality, who had come to Korea to peck away at UN airpower. I made the following observations about both sides during my tour in Korea during late 1950 to mid-1951. On the MiG side of the fence: Markings on the MiGs during that time were many and different. This variety of markings indicated a lot of different squadrons involved. A friend of mine stationed at Chodo, showed up at Suwon one morning in late Spring 1951, talking to us about the different Soviet units from the Moscow defense ring involved in a rotational duty at Antung. Also the tactics employed by the MiGs changed repeatedly during this time. Most important though, was the daily expectation of an encounter with a MiG pilot we referred to as a 'HONCHO'. There was no doubt about a Honcho's skill and experience in aerial combat. Today's historians have uncovered the fact that there were several of these Russian combat leaders flying against us. Now to the US side of the picture. During late summer 1950, after losing a bunch of pilots to other units in Korea, I received (in the 336th FIS) about eight replacement pilots direct from the flying schools, with several more coming to us before departing for Korea. When we left for the West Coast on 11 November 1950, I had one pilot who hadn't been checked out at night flying on my wing! We accomplished that en route! We hadn't had any gunnery or bombing training since the squadron had transferred to Dover, Delaware in the summer of 1950. This inexperience really came to a head during the early operations in Korea. In fact, while briefing my pilots in the Ops tent at Kimpo on 14 December 1950, preparing for the upcoming combat operations, I told my guys that our SOP called for testing the guns over the Pyongyang area of North Korea, inbound to our patrol area. One of the new lieutenants stood up with a question, "Sir, how can I tell if my guns go off?" That was the 'seasoned combat veterans' that we took to Korea. later on, some of these very same green lieutenants distinguished themselves in repeated air to air actions. I would like to compare the MiG units with our own on purely the basis of level of experience. I believe that experience level was close to, if not right on par. I also believe that the advantage the US pilots had was in air discipline, the over-riding importance placed on individual self-reliance in all our activity, and aggressiveness. The MiG pilots were imbued with the concept of direct control by ground radar and the requirement to follow directions that controlled all actions. In the air, with de-emphasis on individual determination. 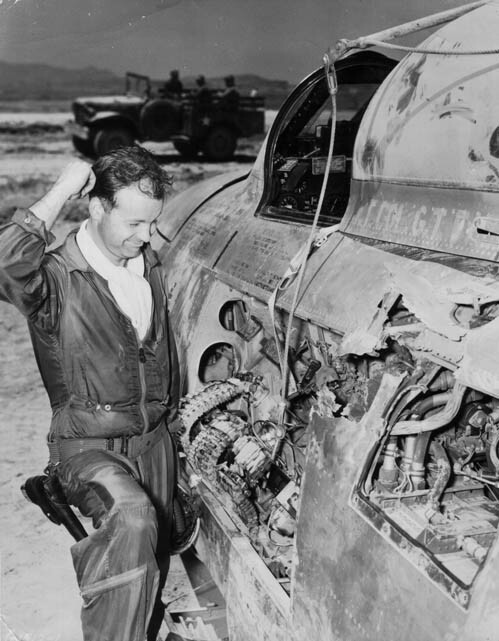 On the other hand, our pilots were briefed everyday with the concept that NO MIG IS WORTH THE LOSS OF AN F-86 PILOT! That was an over-riding law while Col Eagleston and I were in Korea. The skies over northwest Korea during the summer of 1951 were filled with the classic match-up - the best airplanes and pilots that two adversaries could pit against each other. On one side was the MiG-15, a Soviet-built jet fighter with extraordinary rate of climb and maneuverability. On the other side was the North American F-86A Sabre, a tough airplane with more speed than the MIG but not as maneuverable. The pilots were, for the most part, not an even match in any way. The MiG drivers were, it was thought, an inexperienced bunch of Chinese and North Koreans, with very little actual combat time, let alone in jet fighters. On the other side were pilots from the US Air Force 4th Fighter Interceptor Group, some with lots of combat time and many victories attained during World War 2. Usually the Sabre pilots had a field day over the Yalu, shooting down the MiGs with relative impunity. But every once in a while a communist pilot would break out of the cold Korean sky and give the Sabres a run for their money. This is the story of one such communist pilot. It was a bright, clear, sunny day in late June 1951. We had a pretty heavy commitment this day, with two squadrons involved in the mission. Lt Col Glenn Eagleston - 'Eagle' - was leading the 334th Squadron, while I was leading the 336th. The mission was simple enough - a MiG sweep near the mouth of the Yalu River. On this day the MiGs came Lip to meet us. Part way through the patrol line we were on we encountered a large number of MiGs. With MiGs all around us the squadrons had broken down into individual air battles involving 2-ship F-86 elements against the collective bunches of MIGs. I had a 2-ship element at about 25 grand somewhere east of the normal location of MiG Alley. The radio chatter indicated multiple MiGs in that general area. Moving into the general area of combat, I came across a lone MiG maneuvering with the swirl of the fight. The MiG turned away from the battle, heading toward the Yalu. Using manual ranging, I began to close to within 1500' range. (There was no point in attempting to get a MiG kill outside that range.) Moving in to just under that range, pipper leading a tad in the turn, I was ready to hammer him. To borrow a favorite phrase from Eagle - 'I had this one saucered and blowed!' This one was mine! Just as I started to press the trigger an F-86 appeared between me and the MiG I was about to clobber. He was traveling 90 degrees to my direction of flight, and he was all alone - well almost About 500 feet behind the lone F-86 was a MiG, and he was pounding the F-86 with cannon fire. Both airplanes flew directly in front of me and between myself and the MiG I had staked out. For a split second I wondered how it was possible that a midair collision did not occur. As the two aircraft were passing in front of me I noted that the MiG was firing his cannons and the rounds were hitting the Sabre with good results, with flame and fire marking the strikes on the Sabre fuselage. Pieces of the F-86 were flying through the air, and some were very large pieces. One unassailable rule we had in the 4th was that no MiG was worth losing an F-86. The F-86 was now on fire and I broke off my certain kill to try and beat off the MiG that was hammering the Sabre. I had no idea who was in the Sabre, let alone that it could be Eagle. It's surprising how quickly situations change during aerial combat. I pulled the nose around as hard as I could toward the guy in trouble. By the time I had my nose in the direction of the shot-up F-86, he was now about 1000 feet below me. The MiG had overshot the 86, made a quick climbing reversal, and was now coming down in a dive to finish him off. The F-86 had lost most of his airspeed, and appeared to be just hanging there. At that point the MiG driver apparently saw me coming and pulled his nose up, pointing straight at me. We passed head-on with no more than a plane length between us. At that point we both used all we had in the crucial next turn to try and gain some advantage. We went into a Lufberry, in which I had a slight advantage. However it wasn't enough to put me into a firing position so I started a vertical yo-yo on the far side of the circle, using the slight reduction in airspeed at the high point to increase my cornering rate. It began to work. After a few more turns around the circle I was starting to get inside of his turn on the 'tight' place in the orbit The maneuvering Gs were at the extreme. So extreme that my wingman left part way through, later saying that he had become airsick. At this point I decided to try a high angle-off spray at him. Although I had a little inside turn advantage, the MiG was still crossing in front of me at about 60-70 degrees angle off. So, when we began to reach the 'tight' end of the circle, I watched over the leading edge of my left wing for him to appear, then hauled back tight on the stick. As he passed through my nose I held the trigger down and gave him a good burst. On the next orbit I did the same thing. This time the MiG had to fly through the spray from my six 50s. After he took that second burst, and at the far side of the circle (also closest to the Yalu), the MiG suddenly broke away in a high speed dive toward the Yalu and I couldn't catch him before he crossed the river. I broke off to return to the stricken F-86. This MiG driver had been good, very good. He had been waiting above all the engagements going on between the MiGs and the F-86s. It was a well-known tactic that was commonly used by a single MiG pilot that we referred to as CASEY JONES. Ol' Casey was an exceptional pilot, and definitely not an oriental. His normal procedure was to hit fast from a high perch, diving down on any F-86 that was isolated from the on-going air battle, quite similar to a tactic used by Von Richtofen in The Great War. Because of his tactics and flying, plus some close enough brushes with other 4th pilots - close enough for a visual ID - we thought the pilot might be an ex-Luftwaffe guy flying for the Reds. The name 'Casey Jones' came about because the MiG flights leaving Antung were referred to as bandit trains by the GCI radar site at Chodo. This MIG driver had a significant paint job with a red nose and fuselage stripes. With Casey fleeing for safety across the river I began to search for the wounded F-86. I found him floating for home at about 20,000 feet The fires had gone out, but he had holes in the engine aft section, and his left gun bay door and all three .50-caliber guns were gone. The guns had absorbed most of the impact of a MiG 37mm cannon shell and probably saved the pilots life. I tried talking to the Sabre pilot but another cannon shell had entered the fuselage aft of the wing root, wiping out his radio. His airplane was moving at somewhere near .7 Mach and he was steadily losing altitude. About this time I heard a lot of chatter from some nearby F-86s, which made me fear attracting more MiGs, something we definitely didn't need right now. I called for the other F-86s to move away from this area until we could get out of danger. I got the pilot's attention and signalled for him to head out toward the sea and get into position for a bailout over the Yellow Sea where we could get a rescue airplane to him. I'll never forget the pilot in that cockpit violently shaking his head "NO!" By this time I was sure I had a new lieutenant in there, and couldn't figure out his disregard of a possible life-saving recommendation. We continued south, gradually losing altitude, watching for flak, and trying to measure the angle of our flight path with the distance we had to go to see if our gradual descent angle was enough to get us over friendly territory and maybe back to Suwon. It took forever, but we finally made it to friendly territory. I informed K-13 that we had a cripple, to clear the runway, get out the meat wagon and fire trucks, and prepare for a wheels up landing. Flying tight with the wounded F-86 around the pattern to check his airspeed indicator, I came down the final right beside him. The Sabre slowly settled to the runway, finally touching down with a jolt. I watched the pilot's head banging back and forth in the cockpit as he rode that airplane down the runway like a bucking bronco. The Sabre slid to a stop off the end of the runway in a gyration and a cloud of dust. I poured on the coal and went around. After landing, I rolled to a stop by the busted F-86. The airplane was a wreck. Not only was the engine hit, but the throttle control was smashed. The left fuselage was a sieve, with some very large holes all around the cockpit. It was then that I learned that the pilot was my very close friend Glenn Eagleston. Eagle's life had been saved by the three .50-caliber guns that took the impact from the 37mm cannon shell, which also had taken out his throttle and smashed part of the instrument panel. It had been a close call. Eagle had been alone during the battle when he and his wingman became separated during some combat maneuvering. Casey Jones had been alone because that was his strategy." During WWII Glenn Eagleston downed 18.5 German aircraft while flying P-51s with the 354th FG making his two war total of confirmed victories 21.5. His awards include the Distinguished Service Cross, Silver Star, 2 Distinguished Flying Crosses, and 25 Air Medals. 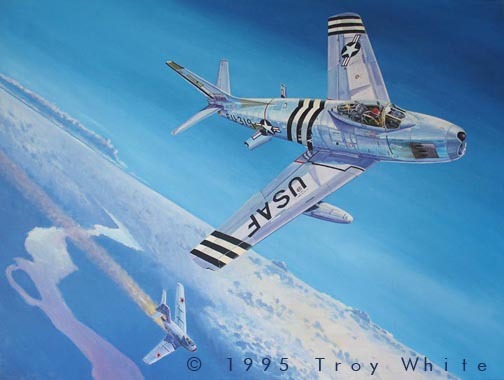 "Looking for Casey Jones" Canvas Giclée PrintImage size: 12" x 28" Lt. Col. Glenn T. Eagleston of the 334th FS, 4th FIW, patrols "MiG Alley" in early 1951. In June of 1951, While flying ops with the 4th, Col. Eagleston shot down three MiGs, probably shot down a forth and damaged seven others. 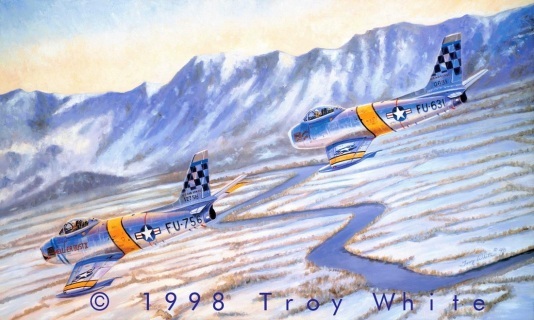 Here are some other F-86 prints you may like.